It’s finally fall in Los Angeles, and you know what that means? It’s below 80 (just barely) degrees and everyone is bringing out the scarves, boots, and puffy coats. We like to call it wishful coating, and if we wear coats and cold weather clothes it will magically become cooler. We girls can dream, right? And you know what fall also means? Pumpkins. Tons and tons of pumpkins, but here at TYL, we like to mix things up and go off the beaten path. 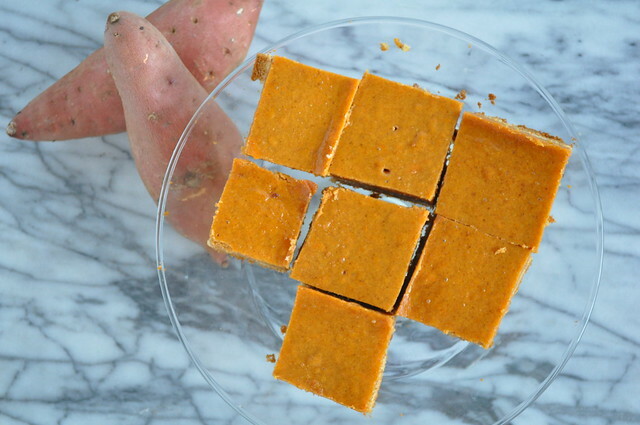 We dare everyone to swap out pumpkins for sweet potatoes. 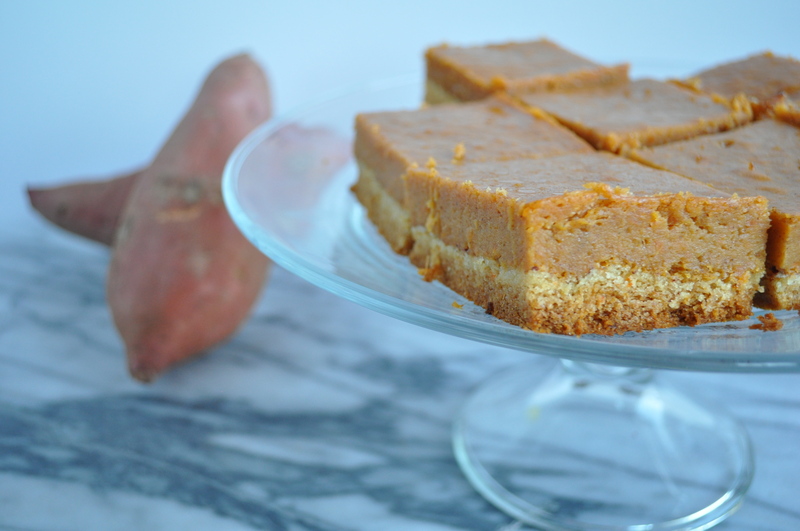 Sweet Potato is one of our favorites, and once we opened the door to Sweet Potato land, we were changed ladies. Before we get to the recipe, we also want to thank everyone for sticking with us during these past few weeks. We finally moved to our own apartment, and it’s perfect! Big things are happening here and we can’t wait to share them with you. 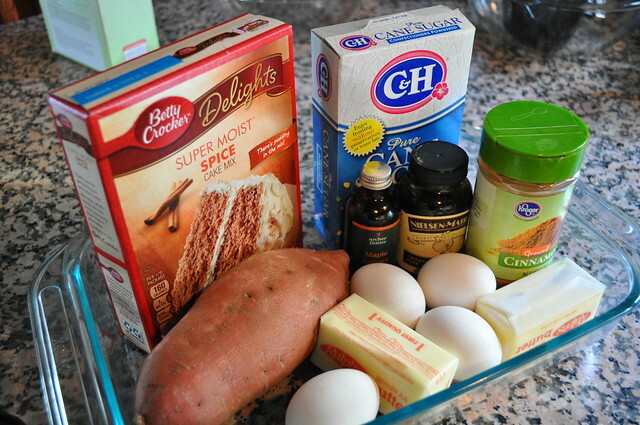 But for now, lets get to today’s recipe! 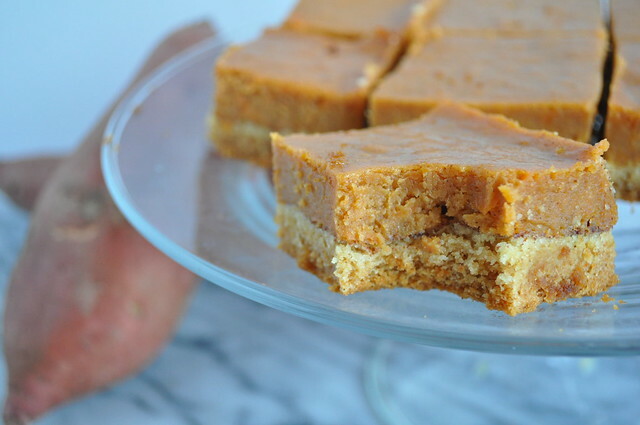 Browned Butter Potato Pie Squares! These are a take on a recipe from Paula Deen, but we fall-ifed it! Please let us know what you think, and if you make it and post it tag us with #twoyoungladies. Preheat your oven to 350°F. 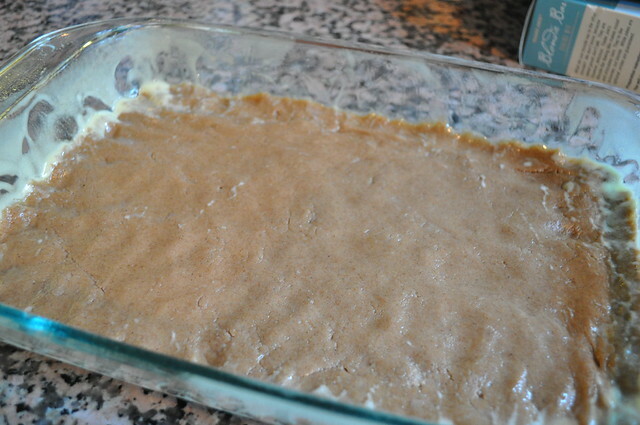 Grease a 13×9 pan with cooking spray. 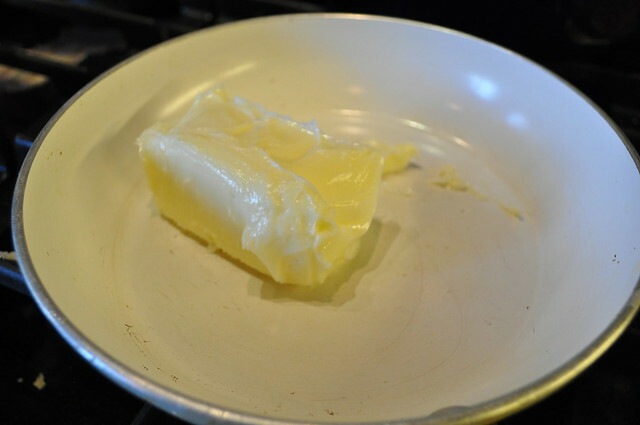 In a medium saute pan, brown your first stick of butter. 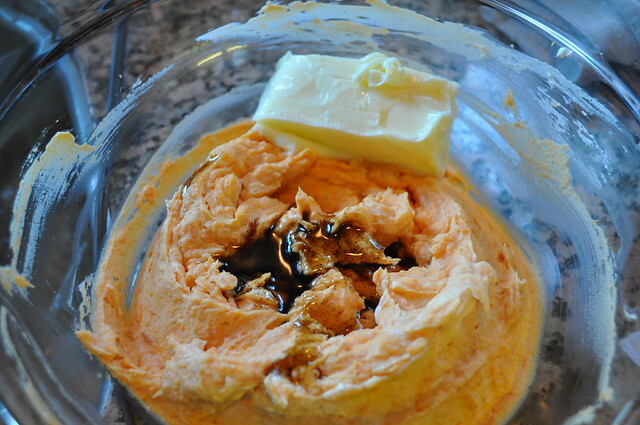 If you’re unfamiliar with browning butter, click here. 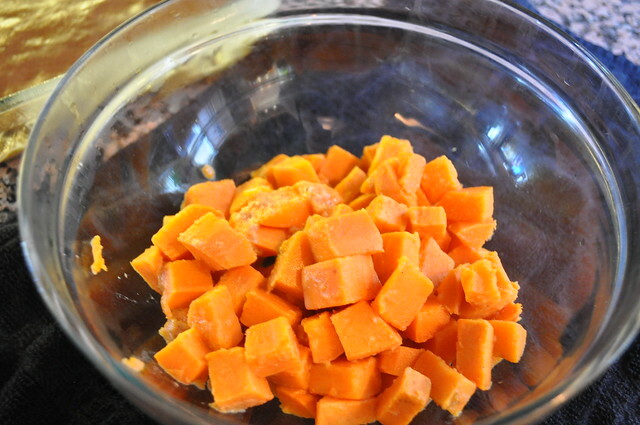 In a medium sauce pan, place your cut and peeled sweet potatoes and covers with a mixture of orange juice and water. Cook until sweet potatoes are fork tender. Drain and mash until smooth, set aside to cool. 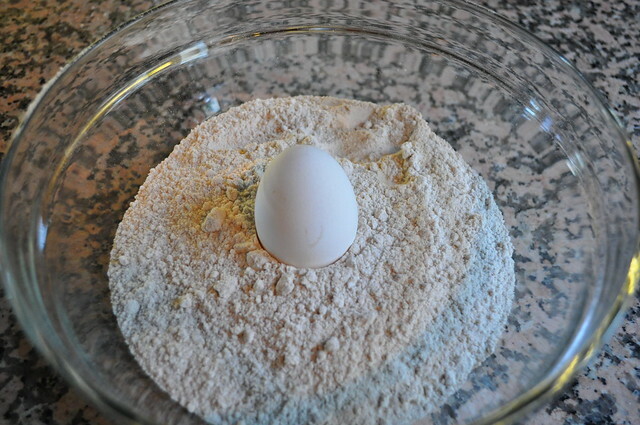 In a medium bowl, mix together, your cake mix, one egg, and your browned butter. Mix well. Pat the dough into your greased 13×9 pan, using your hands until it forms an even layer on the bottom of the pan and set aside. 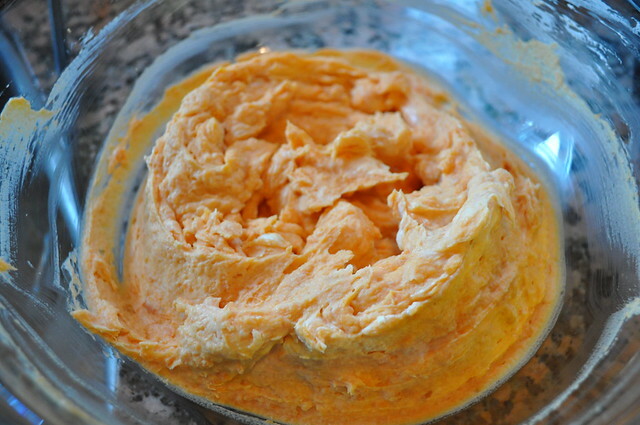 In a large bowl, beat together the softened cream cheese and mashed sweet potatoes until smooth. Brown the next stick of butter. 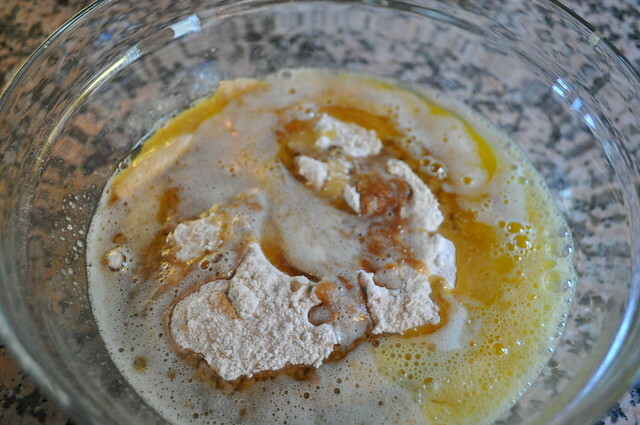 Next add the eggs, vanilla, maple, and the browned butter and then beat together. 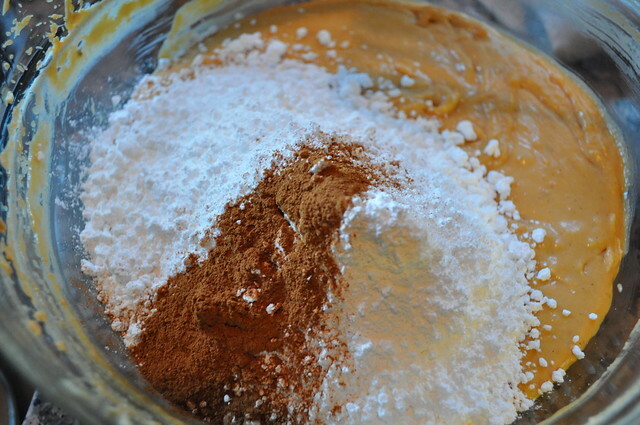 Finally, add the powdered sugar, cinnamon, and a pinch of slat and mix well. 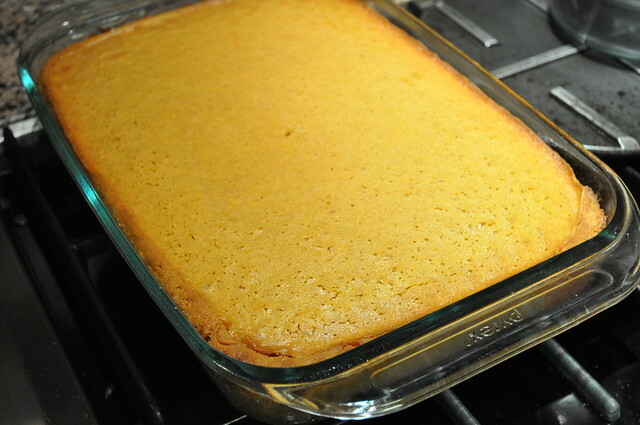 Scrapping down the sides of the bowl, spread the pumpkin mixture evenly over the cake batter crust. Bake for 45 to 50 minutes. 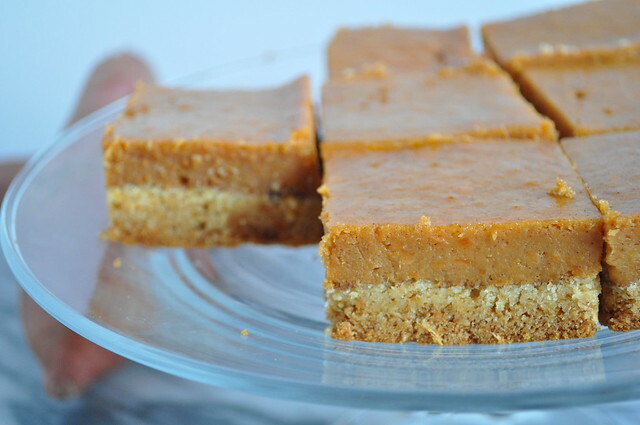 Allow to cool completely and then cut into squares and serve with fresh whipped cream or powdered sugar. Recipe adapted from Food and The Butter Queen, Paula Deen. 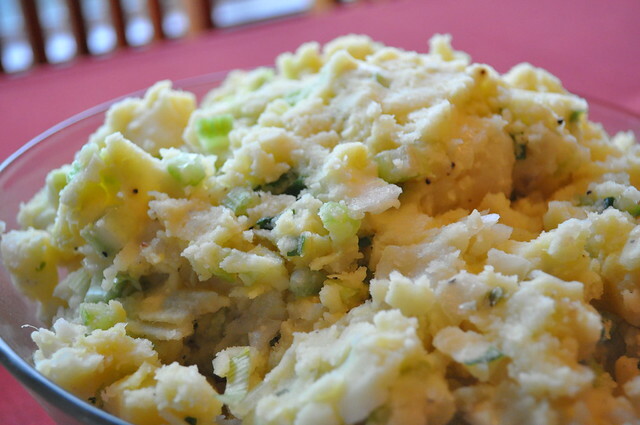 First off, we looked up potato salad to find a few historical tid-bits, but the first observation was that some people refer to potato salad as tater salad. That makes us think of a giant bowl of tater-tots tossed in some ketchup dressing (new idea? maybe not haha). Not necessarily a bad thing, just never heard of that way. 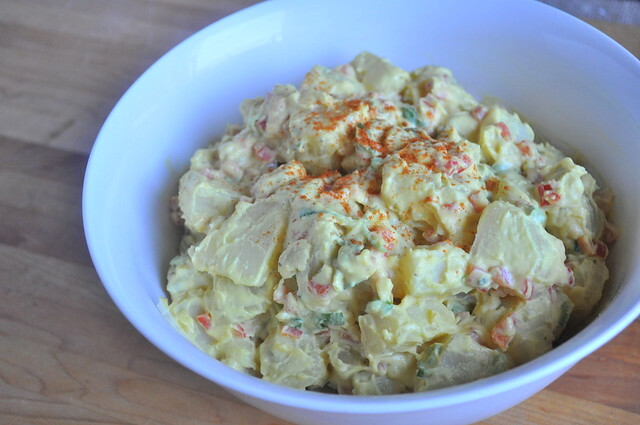 Anyways, potato salad has several ways to prepare it, from hot to cold, mayo to vinegar dressing. The cold potato salad that most of us know came from the British, while the warm vinaigrette Potato salad comes from France. And one of our favorites, the German preparation, hot vinegar with bacon dressing. In a large pot of salted boiling water, cook the yukon potatoes whole until fork tender, but not falling apart. Drain the potatoes and set aside to cool. While the potatoes are cooling, mix together in a small bowl, mustard, mayonnaise, relish and cayenne pepper. Mix well and set aside. When the potatoes are cool enough to handle, cut them into medium sized chunks and put into a large bowl. Mix in the diced red peppers, celery, and green onions. Next add about 1/2 the mayonnaise mixture and stir until combined. If needed, add more dressing and season with a little kosher salt if needed. Put the salad in the fridge and let the flavors meld for at least 30 minutes. 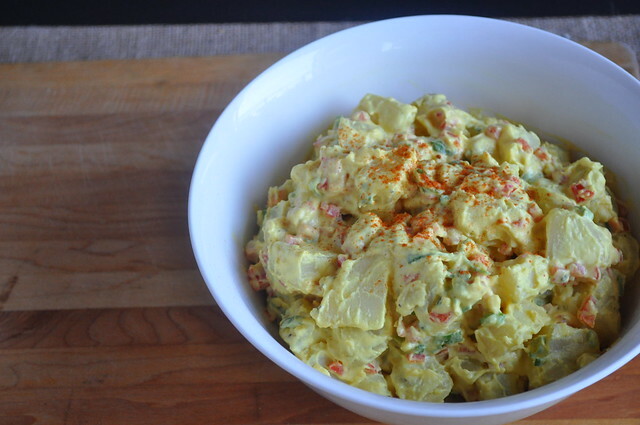 Love potato salad, but hate all the mayonnaise? Then this recipe is for you! 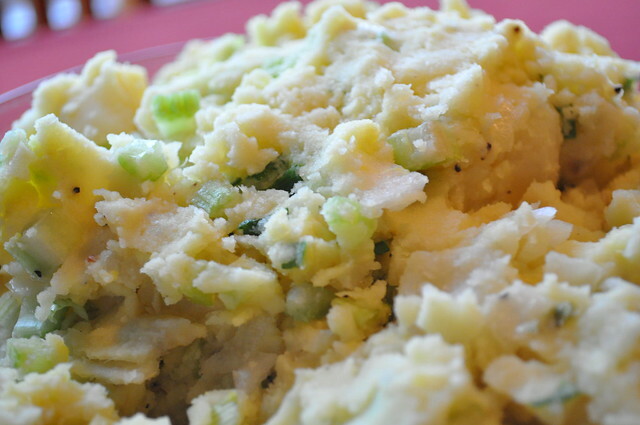 What’s great about this recipe is fact that you’re using the mashed potatoes as the creamy element. You can also add a dollop of sour cream, or even mayonnaise for extra creaminess. But it’s not needed! Peel and chop all your potatoes and place them in cold salted water. Once chopped and peeled, put the potatoes in on the stove and bring to a boil. Cook until potatoes are fork tender. Before draining, reserve some starch water. Drain the potatoes. Return about half of the cooked potatoes to the pot and start mashing them. Add a splash of half and half and one tablespoon of butter. If you’re not feeling the half and half, use some of the reserved starch water. Because of the starch it helps thicken the potatoes but with half the calories! Season the mashed potatoes with some kosher salt, pepper, garlic powder, onion powder, and mustard. Mix well. Next, mix in the onions and celery. Finally, stir in the other half of the cooked potatoes. At this point, season to your liking. If it needs more mustard or salt add now. Can be served immediately, at room temperature or cold. It’s really up to you! 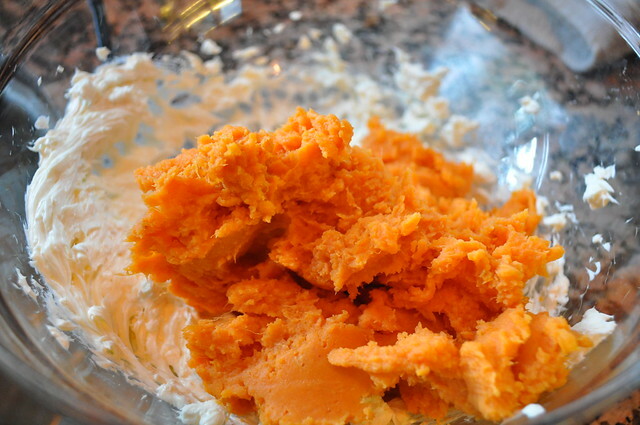 You can also add a dollop of sour cream and mix it in for added creaminess.